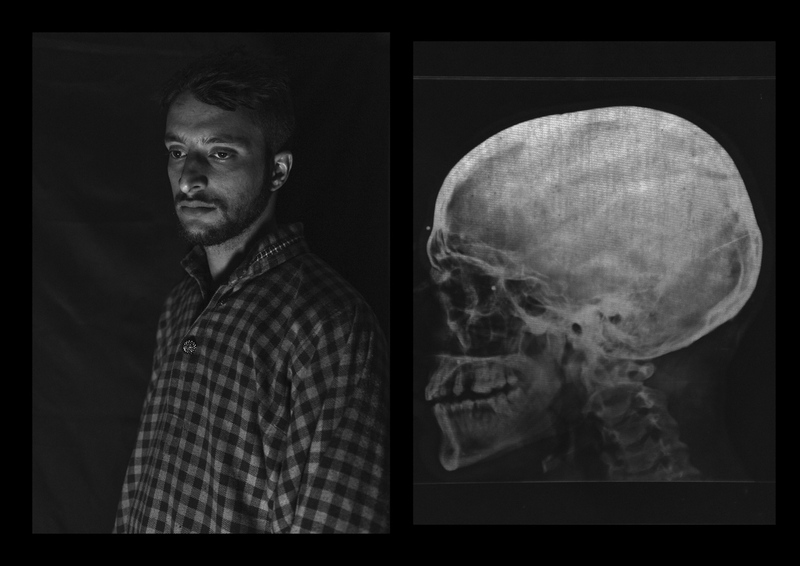 Amir Kabir Beigh, 26 years old, from Baramulla. 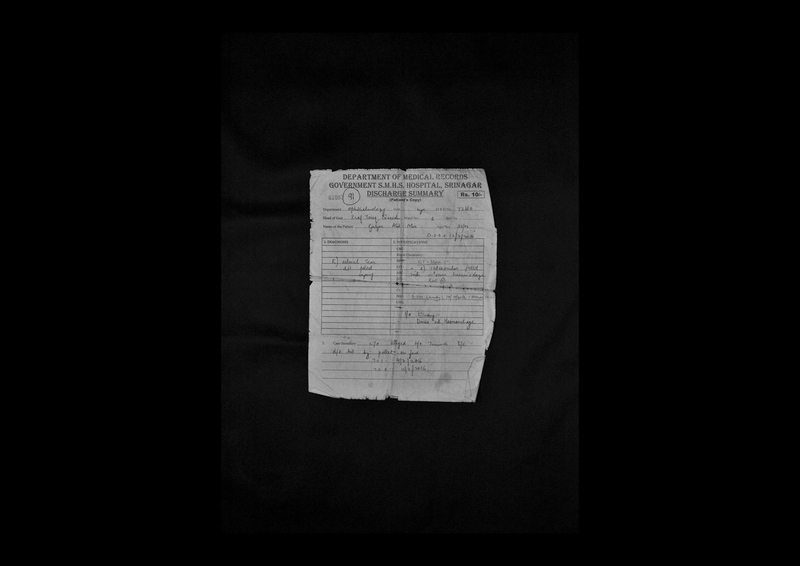 “In September 2010 i was going to buy some medicine for my mother by evening time when a group of security forces fired at me near the bridge of the old town. There had been clashes throughout the day but it was calm at that time. I was alone on the street so only after some minutes somebody found me and took me to the hospital. I have gone through a lot of surgeries all over India but i am still completely blind”. 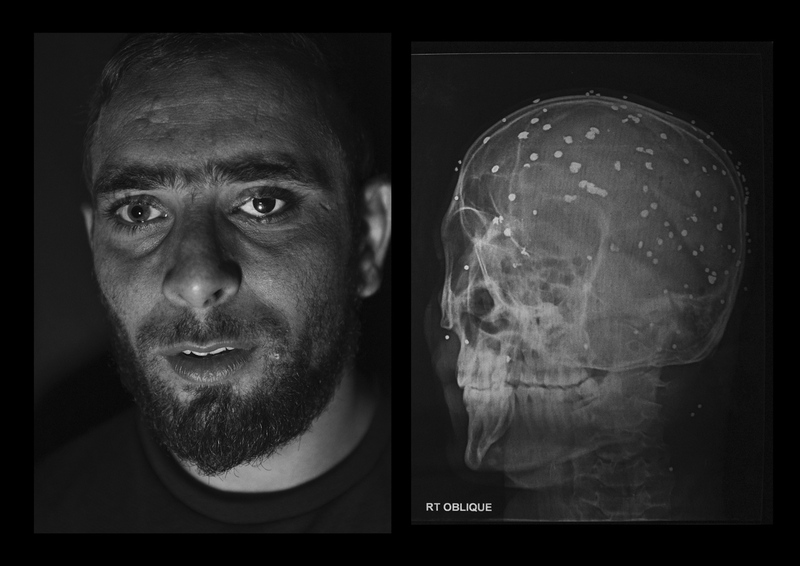 Amir is the first pellet victim of Kashmir, he received hundreds of iron balls on his body. The valley of Kashmir, a territory disputed by India and Pakistan since 1947, is one of the most militarized zones in the world. In 2010 the Indian government provided the security forces deployed in the state of Jammu and Kashmir with a new weapon. Shotgun shells filled with hundreds of small lead pellets are since then used to keep urban protests under control. 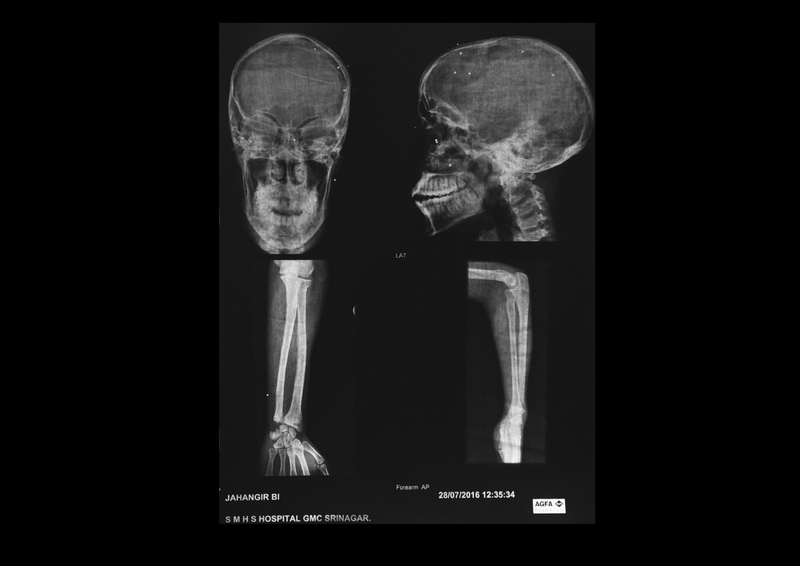 Defined as a “non-lethal” weapon, pellet guns should be aimed at the lower part of the body. On 8 July 2016 guerrilla group Hizbul-e-Mujahideen’s young commander Burhan Wani was killed in an encounter by the Indian army. Popular especially among the youth thanks to his use of social networks to spread his message, Wani’s martyrdom was the sparkle that lighted up the entire valley. The government imposed a four-month-long curfew on the local population, while separatist leaders called for a continuous strike. Hundreds of young boys filled the streets of Kashmir protesting against the “Indian occupation”, throwing stones against the army and the Kashmiri police. Security forces, since July 2016, responded using pellet guns extensively. According to Amnesty International, the new weapon is responsible for blinding hundreds and killing 14 people. Many of the victims were not involved in the clashes with security forces. Those who were hit during the protests tend to avoid speaking about it openly, fearing retaliation by the police. For youngsters left with one eye reading has become too painful, thus forcing them to abandon their studies, giving up the chance of pursuing higher education. Men left blind, the only breadwinner in the family, are unable to work and provide for their beloved ones. Carrying dozens of pellets in their bodies, victims face unknown long term health consequences. 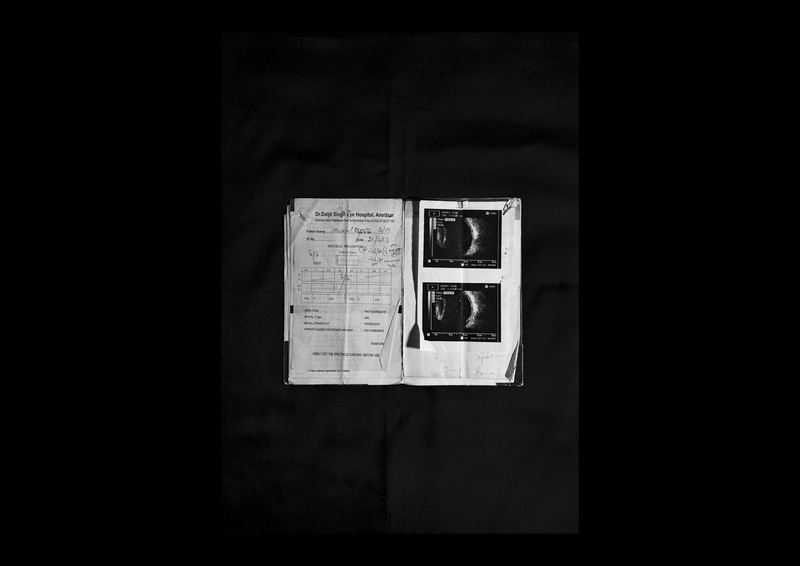 Left partially or totally blind, victims speak of the darkness descended upon their lives. The only things left to see are the faint shadows that surround them. 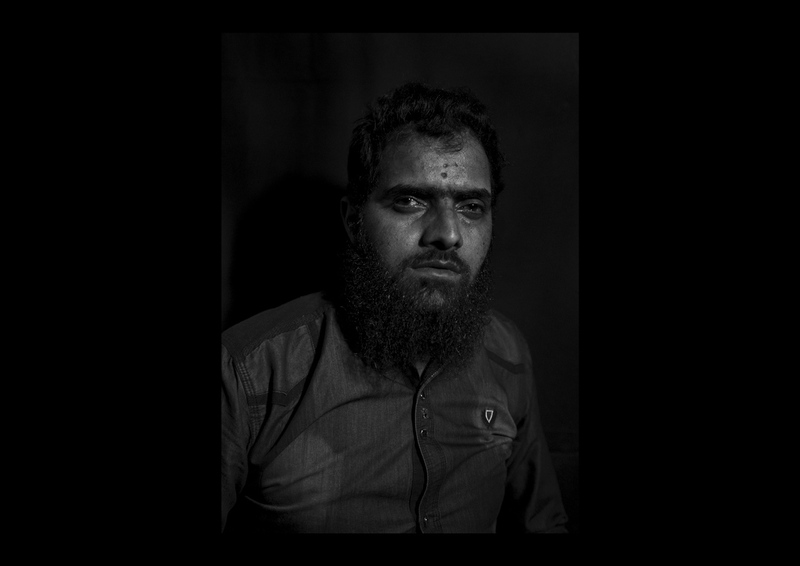 Habid Hussain Kasab, 26 years old, from Anantnag. “I was coming back from the wood workshop on a bike with a friend. We stopped when we saw the clashes going on: the boys were attacking a police vehicle when one of them came out and they randomly fired. As soon as i was hit i put my hands on my eye and i felt the blood coming out. I fainted and woke up the day after in the hospital”. Habid received 2 pellets in the right eye and his vision is baerly 1%. 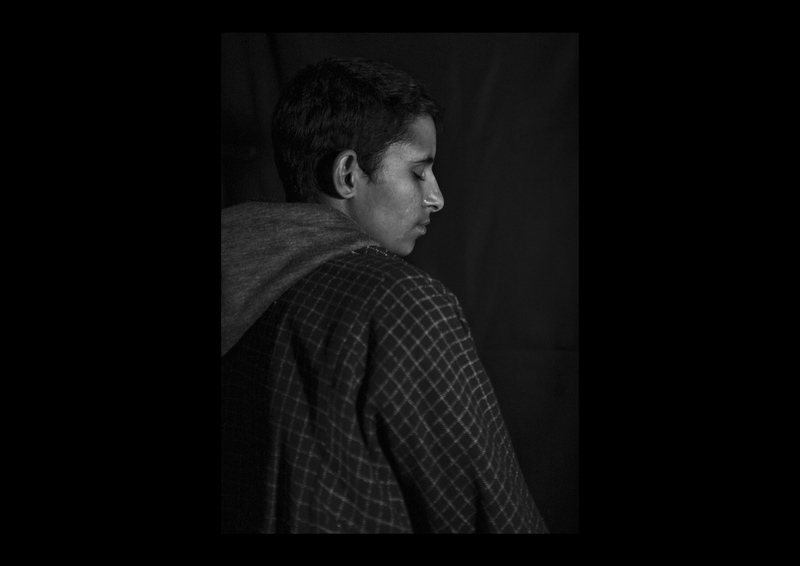 Shahid Ahmad Wani, 16 years old, from Achabal. On the 2nd august 2016 he has been injured during the clashes. He was passing by that aerea but the police targeted him. 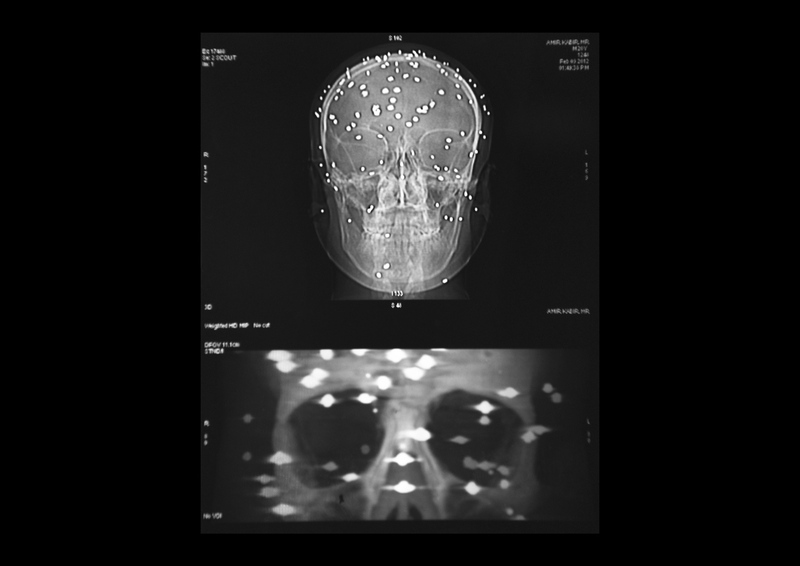 He received 93 pellets all over the body and 2 on the left eye. After three failed surgeries he is now able to see only shadows which is the reason why he decide to end his studying. 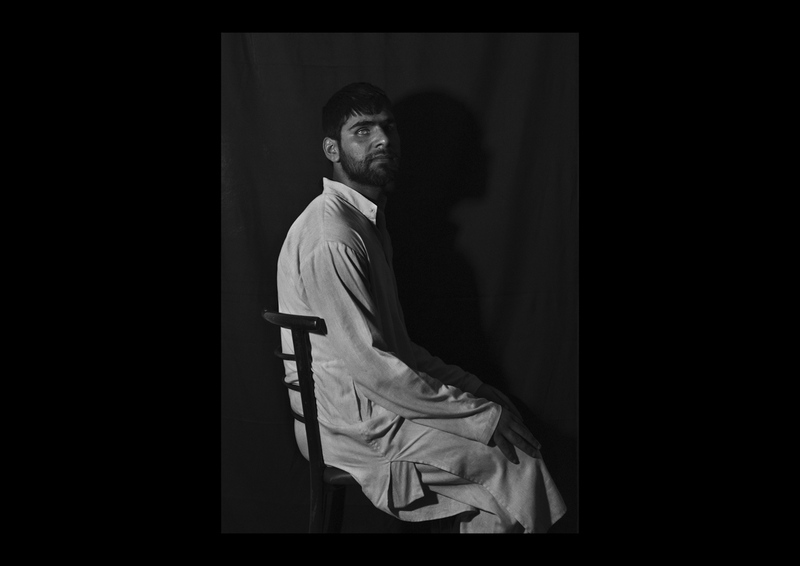 Faiz Firdouz, 18 years old, from Srinagar. “It was the end of July 2016. Clashes were going on outside the mosque of my neighbourhood. I went out to buy some bread and suddenly behind the corner i found myself surrounded by kashmiri policemen that fired at me immediately. Why? What was my fault? Why they ruined my career, my future? The medical treatment is very expensive and my family is bagging for money. Nobody is helping us”. Faiz received 20 pellets out if it 2 damaged the right eye and now he claimed to be able to see only shadows. Shakeela Begum, 35 years old, from Sheeri. “One night we heard some noise coming from outside our house. There were 20 security forces men with two tied and face covered boys. It was a fake encounter – when soldiers kill someone in cold blood while claiming that the casualty occurred in a gun battle. I went out and start to shout to a kashmiri policeman. He hit me with the stick so i slapped him telling he should feel ashamed of what is doing against his own people. After one week some clashes were going on so i opened the gate of my house to check the situation. The same policeman was on the road. He saw me and opened the fire. I immediately faint, but i think i heard him laughing during the last moment”. 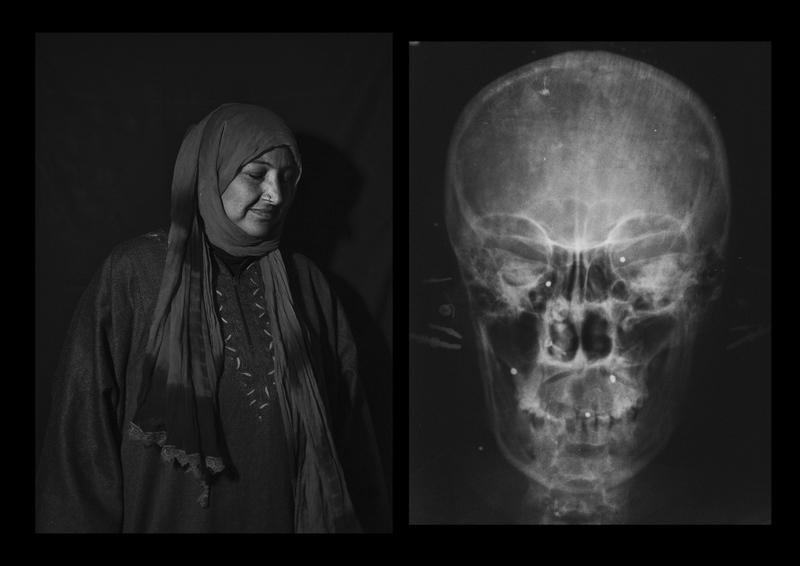 Shakeela received dozens of pellets on the chest, 1 on the left eye and 2 in the right one. The pellets have been shot from a very short distance and they have gone beyond the retina leaving her only 10% of the vision. Gulzar Ahmad Mir, 30 years old, from Achabal. "It was the day after the martyrdom of Burhan Wani - the commander of the kashmiri armed rebellion who's death by the indian army started the 2016 uprising - when i lost my right eye. I can't see anything with it now". Gulzar belongs to a poor family and before the incident he was the only male member of the family who had a job. Now he is not able anymore to go the fields and earn some money. Shabkal Nazir Waseem, 25 years old, from Bijbehera . “It was the day of Eid – the end of Ramadan – and i was watching the clashes happening on the national highway. The policemen saw me i was there and they targeted me. The security forces stopped all the vehicles, including the one carrying injured people. They took me to the hospital by a wood barrow. On the same day 4 person has lost their vision in Kashmir”. Nazir has received 100 pellets on the upper side of the body: 2 are in the right eye and 2 in the left eye. His visual capacity today is 10%. Firdous Ahmed Dar, 24 years old, from Sopore. “I was walking to a shop and there was no protest around but suddenly a Central Reserve Police Force vehicle arrived and opened fire. I screamed for the pain and some people came and took me to the hospital. I just have bought a new autorickshaw - local taxi -selling a piece of land, but now i can’t use it. With it i should have sustain my family instead of being completely dependent on them as i am now”. Firdous received 6 pellets in his left eye. He completely lost his right eye hit by 7 pellets. Mohammad Asif Dar, 23 years old, from Baramulla. “It was 1st August 2016 and i was playing cricket with some friends. Nearby there was some low clashes. Suddenly the kashmiri policemen arrived and shoot at us. I have been hit on the chest, shoulder and head. I can't describe the pain i felt. I wanted to run, but i couldn't see anything, i was about to fall down into a river, but some people helped me and took me to the hospital”. Asif, after 8 surgeries, have 10% left of his vision on the right eye. Manzoor Ahmad Wani, 16 years old, from Sopore. 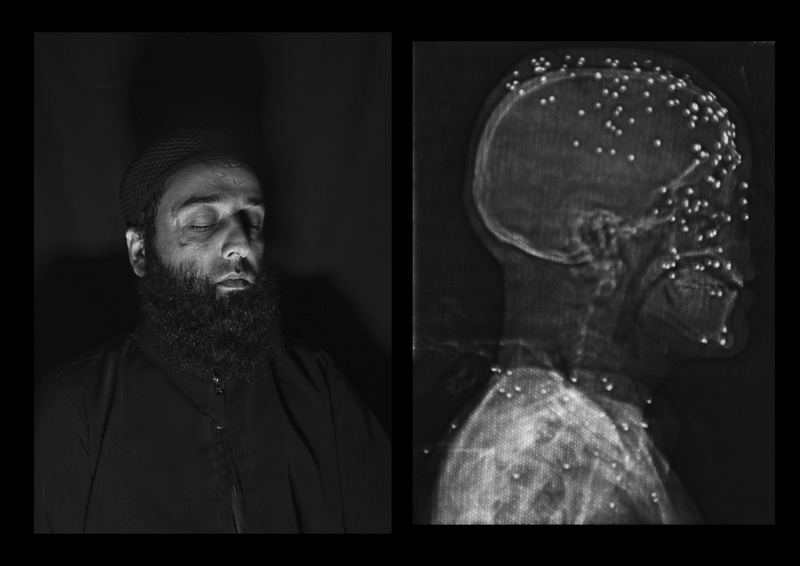 On 5th august 2016, Manzor received 20 pellets on the body and from his left eye now he is not able to recognise the persons around him, but only blurred figures. 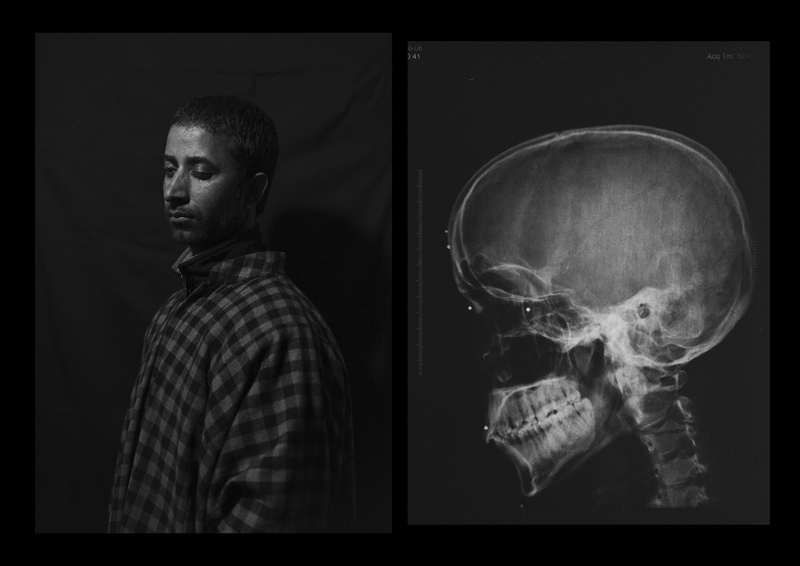 “The police forces shot me from a distance of less than 10 metres. I still have one pellet in my eyes. The doctors said removing it is too dangerous. During the night i am not able to use the mobile and due to the injured i had to drop the school”. Shabir Ahmad Dar, 30 years old, from Sopore. Has been hit all over the right side of his body and one pellet damaged the right eye. His vision is now 7%. On the day of his injure, 5h august 2016, heavy clashes erupted after the Friday prayer in the area of Sopore and at the end of the day 50 people were injured by the pellet guns. Aquib Zahoor Pampore, 16 years old, from Anantnag. “I was on my way to the mosque during the holy month ofRamadan. The prayer had not yet begun and while I was trying to enter the mosque the police opened fire. There was no protest going on. Because of this incident i had to leave the school. 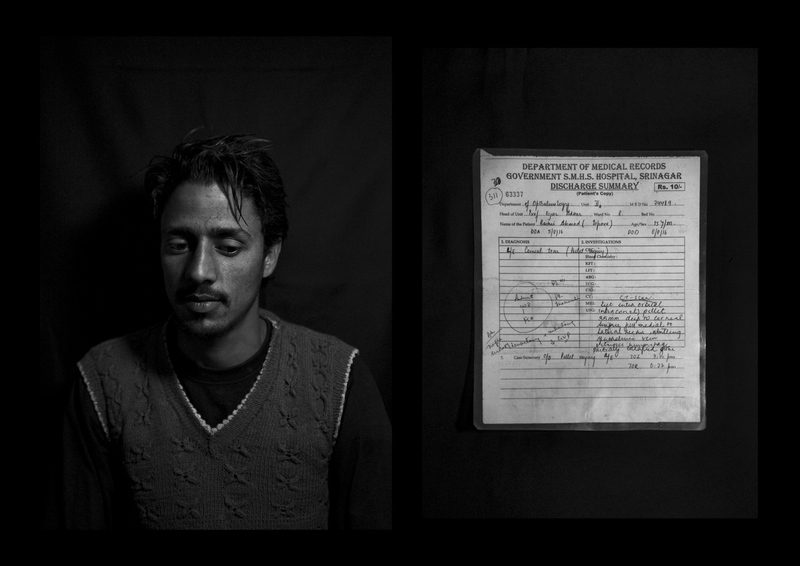 Now the government is offering a job for the pellet victims: they give us money and in return they take our eyes”. Aquib has received one pellet that perforated the retina of the left eye and now his vision is 0%. Arif Yaseen, 18 years old, from Awantipora. 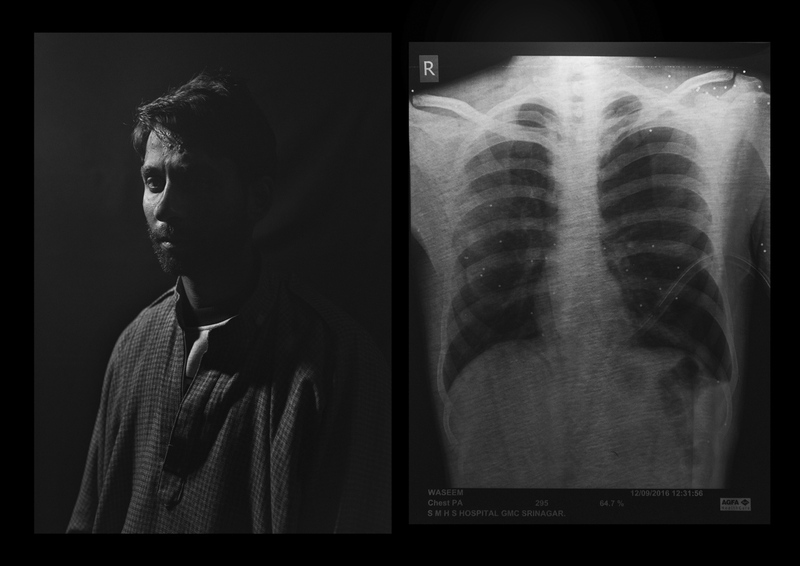 “I was on my way home from work on the 9th July 2016 when i have been hit by pellets. There was no protest in the area at that time. I have gone through 8 surgeries but none could help me to regain the vision of my right eye. The doctors were not able to treat this kind of injuries: the more they tried to take one pellet off my eye, more they were actually pushing it further”. Arif received 2 pellets on the right eye and completely lost the vision. 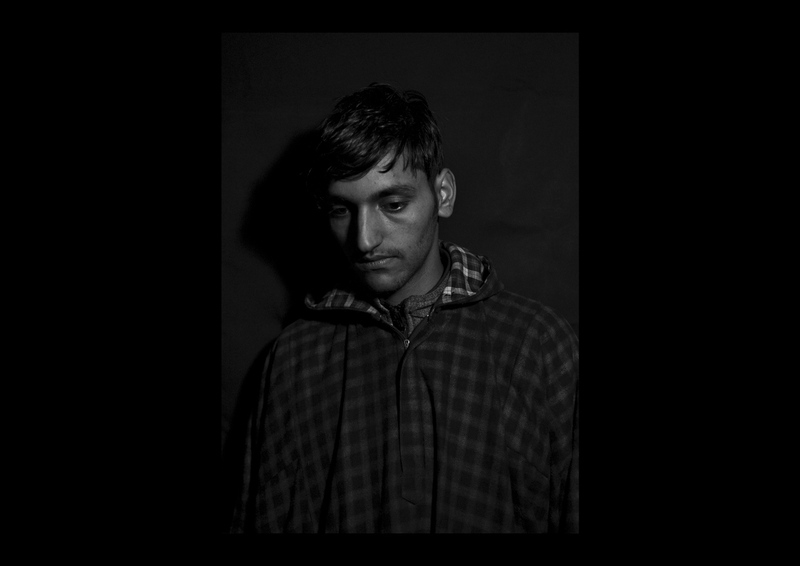 Danish Rajab Jhat, 24 years old, from Srinagar. “It was evening time and the police was chasing the stone thrower in my neighbourhood. I was just sitting on the side of the road and they shot me. I don't remember anything about that moment, i woke up in the hospital. The left eye was entirely damaged so the doctors replace it with an arti cial eyeball”. 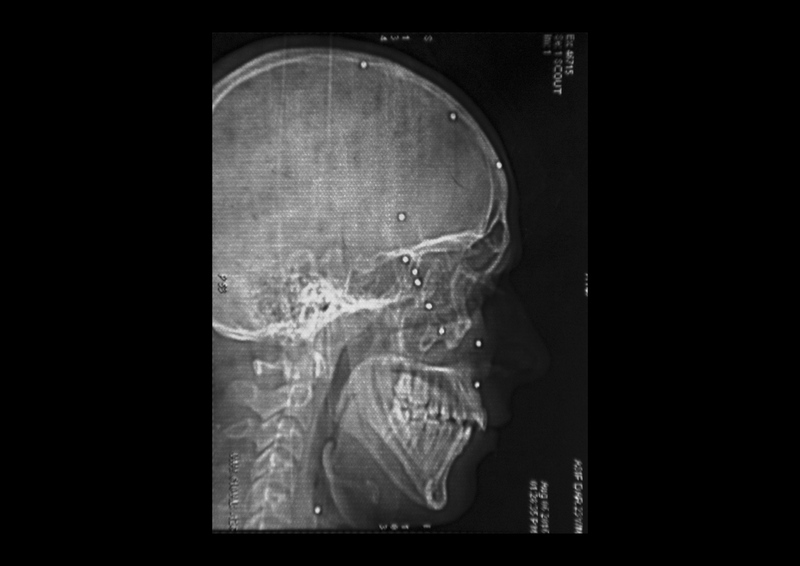 A shell entered through the left eye and the pellets dispersed all over the the head damaging also the right eye. Danish has still 90 pellets inside hi body and from the right eye he can barely see shadows.